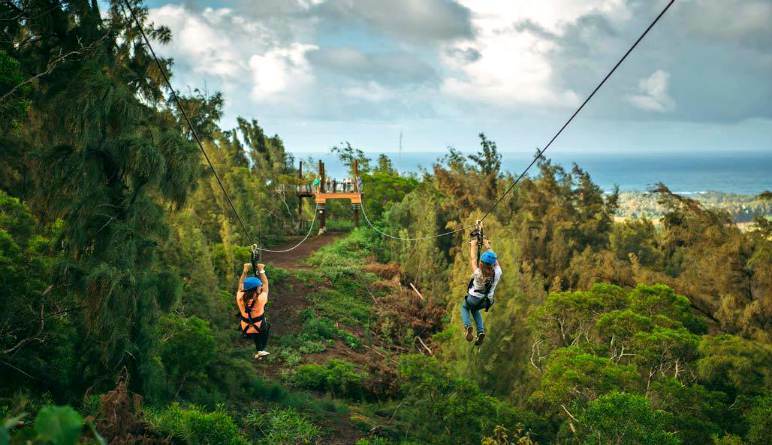 With lengths reaching as far as 2,400 feet, these zip lines are Oahu’s longest! They also offer incredible views. All of the eight parallel lines stretch over sprawling tropical farmland. 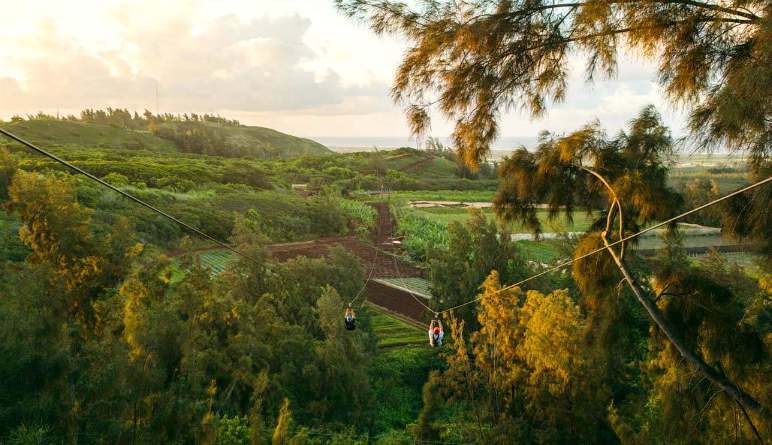 With lengths reaching as far as 2,400 feet, these zip lines are Oahu’s longest! They also offer incredible views. All of the eight parallel lines stretch over sprawling tropical farmland. Take in the surroundings while zooming side-by-side with a special someone! And that’s not all on this grade-A Hawaiian outing. 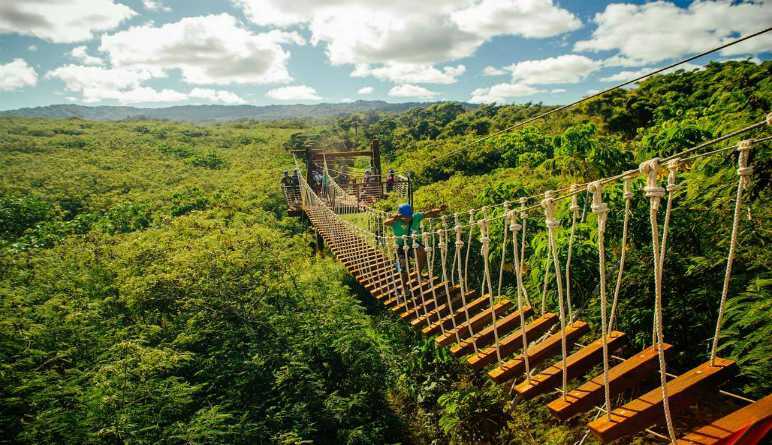 Apart from the zip lines, there are also two rappel lines, three sky bridges and an ATV adventure! It starts on the ATV. Enjoy a two-mile ride to a mountain top! Ride through the jungle and fall in love with all the inland landscapes on display. Arrive at the zip line course where you’ll gear up and receive a brief safety instruction. 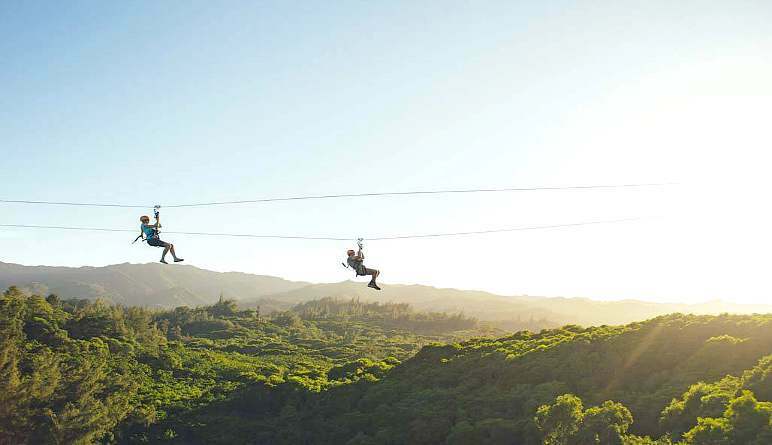 Travel next to a friend on eight zip lines ranging from 500 to 2,400 feet! Conquer two rappel lines and the sky bridge! Marvel at the lush farmland scenery! 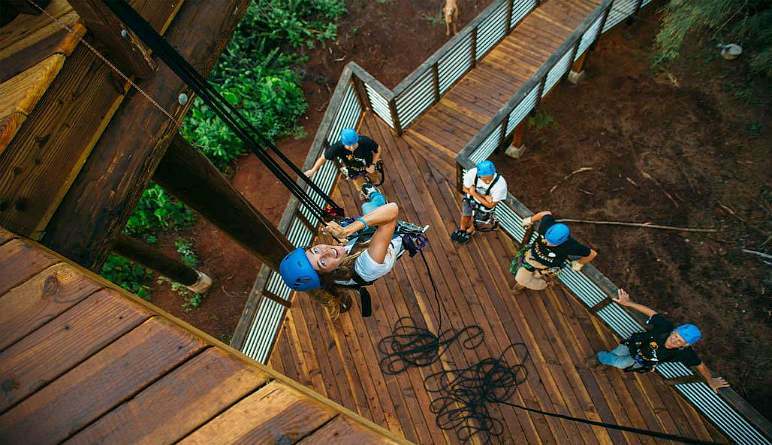 The three-hour excursion is more than just a zip line adventure; it’s one of the best sightseeing outings in all of Oahu (which, given the range of tropical eye candy the island hosts, is saying quite a lot!). i HAD SO MUCH FUN !! my man was scared of heights and he had a great time ! I will go again. my group of guys were the real deal !! thank you guys !! The staff was extremely helpful, friendly, comical, and knowledgeable. They made the experience well worth it, and helped my mom and I overcome our fear of heights. We were impressed by the safety precautions, and felt very secured. I would highly recommend this to others who are visiting the island! Awesome adventure, for all ages. Loved it!! This was a scary experience for me, but I felt the staff was extremely well trained to help me overcome my fears. After a few runs I started to relax and really enjoy this adventure. Thanks to Max, Chin and Beth for a great time for our family. The course and experience were very well designed, super-well engineered, and the staff were truly very experienced, wonderful and attentive to details. Equipment was first-rate, and concern for safety was paramount. I went from fear of the first step off the training platform to being the first one in line to fall backwards and zip upside down! Telling all our friends about it, and will go back. Maximum weight is 270 lbs. Professional photos of each participant and group will be taken from carefully chosen places that capture the most scenic parts of the tour. These photos are viewable and available for purchase directly after the tour.